Opera has announced that version 43 of the Opera web browser is the fastest version ever that it has released for the desktop. It says that instant page loading and Profile Guided Optimization is what makes Opera 43 its fastest version yet for the desktop. 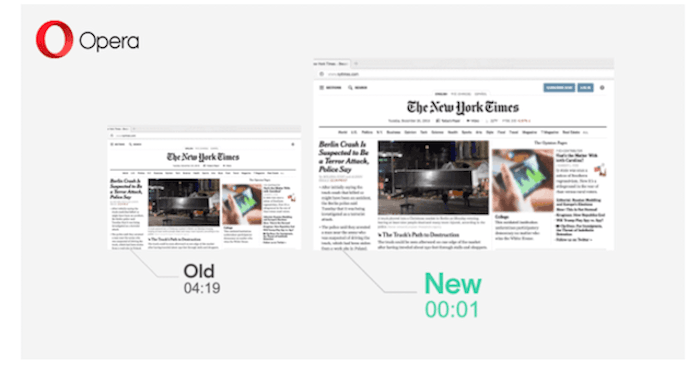 It has been working on improving page loading speeds since last year and has already launched features like page-load speed optimization, native ad-blocking, and faster start-up. It looks like all of that work paid off. The latest version features Profile Guided Optimization and instant page loading which provides another boost that will make loading time for users even better. Instant page loading predicts which website the user is typing the address for and once it recognizes it, the web browser automatically starts loading the website in the background even before the user hits enter. That is an awesome feature alone. It becomes smarter over time by learning which URLs lead to a specific website. Profile Guided Optimization is a new compiler technique that allows software running on Windows to run faster. It lets the compiler know what scenarios are important so that Opera can perform those tasks even faster while using less processing power. This makes startup 13 percent faster.